Seeing as the WCC and the NZTA seem to want us (the public) to be discussing possible alternatives and pros / cons of the Cycling Masterplan, I thought that I might, as a starter for 10, offer up a little alternative. To me, the info provided by Strava is insightful, especially concerning where cyclists ARE currently actually going. I’m a weekend cyclist at best, taking it slowly, an old grannie on a Raleigh twenty, compared to the weekday road warriors who just want to get from A to B, clad in skin-tight lycra or swathed in flappy old shorts, but on a serious speedy machine. I’m happy to cycle on the shared path at Oriental Parade for instance, and not have to wear a helmet, safe in the knowledge that no car will run me over – and nor will I run over a jogger. We can both happily co-exist. But hardier urban cyclists don’t want to have to put up with star-struck love-sick couples pushing a pram, complete with flotillas of nippers swarming around their feet. Instead, they use the road. All they want from a road, is clean, flat, no bumps, no cars in their lane, no-one backing into their path. Fast. Quick. Straight. Flat. Did I say Fast? So to me, the idea of a cycle-route through Courtenay Place is anathema. No one in their right mind would want to go down that street on anything other than a bus or on foot. Or poured into a taxi on the way home. Worst. Cyclepath. Ever. In response therefore, I’ve drawn up a stab at where cyclist might want to go. I’d refute that anyone would want to go straight west across the city from Basin Reserve to the motorway. Yes, that is where the cars want to go – but who would go that way on their bike? Utter madness! Instead, I would propose that cyclists want to avoid the nastiness of Kent and Cambridge, avoid the State Highway routes down Vivian and up Buckle, and instead would rather have a 99% dedicated cycle route across town. I’ve picked out part of Tory, and Ghuznee – think of these with cars BANNED and just bikes. Van access in the wee hours for loading and unloading, but otherwise a predominantly cycle friendly route. But I think any cycle route needs to be designed in with a fully functioning Rapid Transit Public Transport route as well, so I’ve shown that as well. Before we go any further with Victoria St type redevelopments, the city should have this conversation: where does PT go – and create dedicated lanes, with no cars (no taxis, no Uber, no motorbikes, just public transport) – and also where do cycles go – and also create dedicated lanes, with no cars (no taxis, no Uber, no motorbikes, no buses, just bikes). Comments? Marks out of 10 ? That’s a nice idea, though it might take people a while to accept car free roads. As an Aro Valley resident, I do find the current Basin Reserve – Karo drive cycleway useful, but you’re right that cross town route closer to the centre is needed. 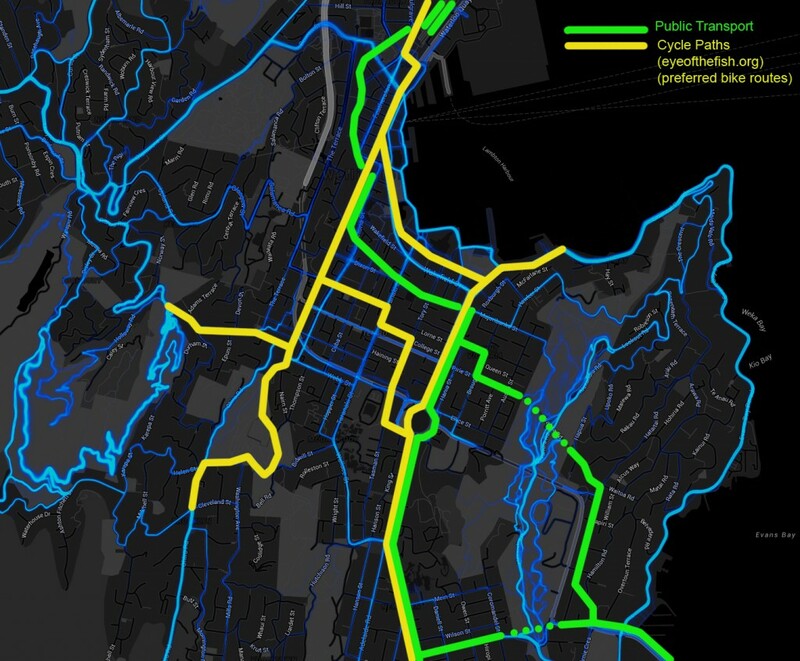 Thanks Alastair – interesting that you use the Basin Reserve – Karo route – I’ve not noticed many cyclists using that, so it is good to hear that there is some (well, at least one). My thinking on that cross town route is that it could be the route I would take if I was on a bike, and there was no traffic around – obviously some cross-over areas – and it is also flat, and so hopefully fast. Perhaps I should clarify – I meant that, say, Ghuznee, where I have drawn a big yellow line up there, could still have a car lane, but would also have a separated 2-way bike lane. Perhaps even just one way for cars: a single, one-way lane for them, and a single, two-way lane for bikes. On Cambridge Tce, obviously there is miles of room to delete an entire lane, and replace with a new two-way cycle lane. On Willis St, it is a lot harder, but first step would probably be to delete a lane of parked cars. We need to be thinking in these big steps, not little stretches, but BIG steps. Seize the bull by the horns. Seize the Day!